What’s your current position and what do you do? CEO of StartHere Pty Ltd, incorporating Rewardshere.com.au, PricePal.com.au and soon to be released folo.world. We are a shopping technology business that allows consumers to receive a cash discount when they shop online and for companies and charities to use our white labelled solution as a fundraising and loyalty tool. What other activities are you involved in? I love spending the little spare time I have today with my kids and am involved in their sports activities such as Tae Kwon Do and Athletics and also playing sport myself, my latest interest is distance walking and trekking. I also like to assist Not for Profits with business and marketing assistance as a way of giving back. Is this what you expected to be doing when you were at school? I had no ideas what I wanted to do when I was at school, although I did go to Uni and get a teaching degree. I am not a believer in having clear career paths as I believe it boxes people in. I think that most successful and happy contributors in our workforce understand what skills, strengths and weaknesses they have and find ways to make use of those skills by filling needs. I am more a believer in individuals building their ongoing skills and then understanding how to best market these to employers or through starting your own business. I stacked shelves at Franklins supermarkets! Can you tell us about a significant turning point in your career/life? The biggest turning point I had in my career/life was the day that I stopped working for money and started following my Purpose. I strongly believe if you follow your purpose and are successful at what you do other rewards like the money will follow. Who do you admire? Who has inspired you? I admire my parents, as they created the foundations and moral compass that I base my life on. I am inspired by my wife every day and particularly by those in our society who aren’t afraid to carve out their own path. If there were no limitations, what would be in the future for you? I am a strong believer that we all should live every day as if we have no limitations and I attempt to follow this consistently. Most limitations are self-imposed and can be easily removed. As soon as we remove these barriers from our thinking anything is possible. I think we should all get up every day with the belief that nothing can stop us achieving what we set after. Finally, what would you tell your younger self about work and careers? Understand your purpose, follow your own path, don’t replicate others and most of all have fun. This entry was posted in Careers, Case studies, Motivaton on September 16, 2015 by Harriet Rochester. It seems basic. If you like what you are doing it doesn’t feel so much like work. If you enjoy doing something you are more likely to continue doing it and do it well. So shouldn’t a personality assessment being used to measure job suitability include measuring work satisfaction? Measuring work satisfaction is essential to determine motivation and forecast whether an individual will prosper, succeed and stay with the organization. Most behavioral and personality assessments fail to measure work satisfaction and are therefore limited to predicting personality. Harrison Assessment’s twenty five plus years of research prove that employees who enjoy at least 75% or more of their job are almost 4 times more likely to succeed than employees who enjoy less than 75% of their job. Measuring factors related to work satisfaction makes it possible to predict job success and therefore hire, motivate and retain top talent. Enjoyment and Performance are linked because the level of enjoyment that an employee has while performing a particular activity is directly related to the level of their performance relative to that activity. When people enjoy a task, they tend to do it more, and get better at it. Like a self-fulfilling prophecy, good performance creates acknowledgment and/or positive self-regard which then causes people to enjoy the task even more. Harrison Assessment solutions predict performance, work satisfaction and retention. They enable companies to motivate people and increase their performance by assigning the roles and responsibilities that give them the highest degree of work satisfaction. Harrison Assessments also enables companies to show their employees that they care about their work satisfaction. This genuine concern in itself evokes a positive response from employees. The mutually beneficial outcome is that both employees and employers win! This entry was posted in Assessments, Careers, Coaching, Engagement, Motivaton, People Management, Performance Management, Recruitment, Teams on September 16, 2015 by Harriet Rochester. If you think when you go for a job interview it is a nail-bitingly painful affair, imagine what it’s like for a manager who has to screen through all the job applications, narrow down the best and then conduct each and every interview while other tasks keep piling up! Once the interview is over, all the job applicant has to do is wait patiently for the call that may or may not eventually come. The manager on the other hand, has the task of deciding who is the best among the many hopefuls to fill the vacancy. If not using a job fit assessment there’s not much to go on. The stakes are high. If the right candidate is chosen, the company proﬁts. The wrong one it can be a very expensive horror hire. So how does one pick the person that is exactly the right ﬁt for the job? And how sure are you that the person who ‘aced’ the test will actually pass with ﬂying colors in the workplace, now and in the future? Some might choose to go purely by gut instinct; others will base their decision on the recommendations of colleagues and friends. The results can be so very right or disastrously wrong as one small local engineering ﬁrm discovered to its dismay. The firm had hired a manager who was highly recommended and who supposedly had chalked up quite an impressive resume working with multinational companies. The new manager was hired to help streamline the company’s operations but in the ﬁrst three months, he behaved so arrogantly towards other staff, they refused to work with him and chaos ensued. The company was forced to terminate him only to discover that he had obtained the e-mail contacts of all their clients and associates which he then used to exact revenge. He emailed allegations against the company to their clients and threatened to cause even more malicious damage to the company’s reputation, unless they paid for his silence! The enraged company was forced to hire outside expertise to investigate his background, counter his claim and fend off his allegations. They paid for a due diligence report to be conducted and forwarded the report to their clients. Then they hired a lawyer to block further action by the ex-employee. With so much at stake today, it’s time for employers to ramp up the assessment process and cull those who misrepresent themselves. Using the Harrison Assessment can help you avoid the very expensive horror hire and keep your organisation profitable. This entry was posted in Assessments, Careers, Case studies, Coaching, Engagement, Motivaton, People Management, Performance Management, Recruitment, Teams on September 14, 2015 by Harriet Rochester. According to a study by the Quantum Work Place “Employee Engagement” has declined to the lowest point it has been in eight years. Despite the improving economy, employee engagement declined in 2014 across organisations of all sizes and in more than 75 percent of the markets measured through the Best Places to Work program. Employee engagement among Best Places to Work was on a slow, steady incline, as organisations recovered from the 2008 recession. However, this past year, engagement dipped to only 65.9 percent of employees engaged. Prior to 2014, employee engagement was lowest in 2010 with 66.7 percent of employees engaged. Although the majority of employees were engaged, these trends indicate a slight shift toward uncertainty and suggest that organisations have more areas for improvement than in previous years. Almost half of the items with the highest uncertainty were related to how employers value their employees, whether through compensation, recognition, or growth opportunities. Employees should not be treated as a means to an end. Engaged workplaces exhibit a commitment to employees in how they are supported, recognized, and developed. One-third of the items with the highest uncertainty were related to global information, or how information is shared throughout an organisation. Whether it’s understanding their personal future or getting feedback regularly from managers, employees lack confidence in their managers’ ability to communicate. These areas of uncertainty represent areas of opportunity for employers. By offering clarity and improving in these areas, employers can improve employee perceptions and engagement. One of the easiest ways to improve employee relations and engagement is through the use of a job-specific assessments such as Harrison Assessments. Now you can measure intrinsic behavioral factors that drive individual engagement — employee motivators and attitudes! Take the next step in engagement initiatives! Align employee intrinsic factors with organisational extrinsic factors to maximise engagement. This entry was posted in Assessments, Careers, Coaching, Engagement, Motivaton, People Management, Performance Management, Teams on September 7, 2015 by Harriet Rochester. There are typically all sorts of personalities working in an organisation. Do you have a few “ego almighty’s” working in your company? Tends to focus on self-justiﬁcation and excuses for certain actions or inaction. Does not embrace change in routine and styles willingly. Works well and clicks with those who are like-minded. They are also prone to making decisions or choices according to those who fan their ego and dance to their tune. Egotistical, overly self-conﬁdent with a very high opinion of their own views and decisions. Low intent and desire for self-improvement. Lacks progressiveness and is inward looking. Difficult to convince and can be rebellious towards change and new initiatives. Draws a lot of energy from direct supervisors in their constant efforts of trying to get alignment and engagement for these Ego Almighty individuals. Needs to be given speciﬁc performance criteria. Coaching discussions to identify personal values and direction to establish gaps between company direction and the employee’s own interest. If the behaviour becomes too intense to handle, the ﬁnal option may be to manage the person out of the organisation. You may have invested a significant amount of time, energy and training dollars in this person. If you choose to manage them, give them a work fit assessment such as the Harrison. This will guide you to a developmental plan that may harness some of the ego and motivate them to work in the company’s interests and not just their own. This entry was posted in Assessments, Careers, Coaching, Motivaton, People Management, Performance Management, Teams on August 27, 2015 by Harriet Rochester. When Judy Palmer-Brown and I first met, we were both working at a higher altitude – in the beautiful Blue Mountains, west of Sydney. There have been many changes for both of us in the 15 or so years since then. It’s been great to have our paths meet again more recently and to have the opportunity to hear her very interesting and inspiring career story. Employment Services Project Manager for WSI – TAFE NSW. My role is to engage and work with clients from a range of organisations who work in the field of recruitment and employment services. These organisations place unemployed people into training and sustainable employment to assist them towards achieving independence. Not at all. I had considered becoming a legal secretary or a nurse. Both were considered traditional occupations for females who had not gone on to university studies. Tertiary education wasn’t considered as a serious option for girls in the Blue Mountains in that era unless they were highly successful students, wishing to become a teacher, or their parents had completed tertiary education and were encouraging them to go. When I first left school I trained to become a secretary at a well- known private college. It was quite expensive and I was having difficulties paying the fees. I left the course half way through due to the financial pressure, coupled with a flagging interest in secretarial work, in favour of nursing as I could train on the job. From the time I was 14 years old, I worked part-time at a local service station that doubled as a general store. I learnt to pump petrol, use a cash register, stack shelves and maintain a mini delicatessen. I worked two afternoons after school and each Sunday. My best friend worked alternate weekdays and the Saturday. We were earning good money although lamented that we never got to see each other. This was my first lesson in the importance of work/life balance. My first full-time position was as an enrolled nurse. I enjoyed learning and caring for others although had nagging doubts about if it was truly the career for me. I was beginning to wonder if one actually existed. I became a single parent at quite a young age when my first marriage broke down. I wasn’t able to continue working as an enrolled nurse as child care was too difficult to manage as a shift worker. I worked in a range of different roles including banking, clerical, reception and hospitality accommodation services, as my six months of training had given me enough skills to gain entry level positions. While my roles were generally junior level, I gained insight into the running of business and I developed an interest and passion in starting a business myself; however I was limited as I didn’t have management experience in any particular field and had no capital funds for a traditional start-up. What I did have though was desire, drive, and a vacuum cleaner. I set up a cleaning business and used my experience in hotels to benchmark a high level of service backed up by a quality improvement and feedback program to ensure my clients received personalised service that exceeded expectations. The business grew quickly and I began to hire staff. After several years of running my business, I began to feel that I needed a new challenge so made enquiries at my local TAFE college about studying Business Management, although I was open to other avenues as well. I met a dynamic head teacher in Tourism and Hospitality who encouraged me to gain qualifications in Hospitality Accommodation Services to complement my work history so I could share my work experiences as a teacher. Teaching was an amazing experience. I had discovered a whole new passion. That was in 1996. I have since gone on to complete a Bachelor of Adult Education and specialised in language, literacy and numeracy teaching in conjunction with labour market programs and workplace training. Completing a degree also gave me opportunities within the TAFE sector, ultimately leading to managing programs for the Institute and working in the commercial sector. My current position allows me to indulge in my passion for business along with developing training opportunities for people like myself, who have found themselves in a limited capacity to develop a career because of personal circumstances. I firmly believe that education is the greatest investment you can make in yourself. I know this is going to sound cliché… however I admire Richard Branson. Richard has boundless enthusiasm and an absolute sense of self that allows him to stretch and grow his business while continuing to challenging himself and inspire his employees. The Virgin group is as diverse and vibrant and the founder. I want to work for myself again. I want to build an enterprise that I can be immensely proud of; one that inspires others and provides opportunities for employees to feed their ambition and achieve their own personal success. Education, education, education! I can’t stress enough how important it is educate yourself. Education is powerful. Be open to ongoing learning, whether that takes place in the traditional sense or through mentors. Gather people around you who are positive and generous with their time and knowledge and then reciprocate and pay it forward to people who you can assist and influence. Aside from gaining a qualification, studying builds self-confidence and develops a broader understanding of the world and how it works. Share everything you learn. Do you know someone whose career story should reach a wider audience? Please let us know! This entry was posted in Careers, Case studies, Motivaton, Training on August 10, 2015 by Harriet Rochester. It’s tempting to say that your best employees don’t require rewards because they are probably already highly engaged. I’m sure some businesses operate that way, but it’s certainly not sustainable. When you have employees you would like to keep, there are a few simple — and free — measures you can take to both reward and retain them. Unless they know what they are working towards, it’s difficult for even the most highly motivated team members to stay enthusiastic and productive in the long term. On the other hand, if they expect their efforts to result in them being part of a team (or leading the team) that excels at what they do, they will work hard to get somewhere they can be proud of. More money in their pockets — or your pockets — is not a sustainable reward and retention strategy. There’ll always be someone else who will pay an employee more if they’re a top performer. As Simon Sinek reminds us in his book Start with Why, profit is an outcome; it is not a purpose. Like you, your team want to know why they’re doing what they’re doing. How often have you set KPIs (Key Performance Indicators) for staff based on your business plan, then not referred to them until their next performance review? As a business owner or manager, you are constantly monitoring results. Are you keeping the people who are responsible for achieving those results up to date with their progress against their targets? Of course, this involves sharing the bad news as well as the good. While it seems to come naturally to be careful about what information we share, it’s just as important to be mindful of how you share information. It’s your job to communicate. You are responsible for doing as much as you can to ensure your message is clear and appropriate for the person receiving it. Your best employees often have the capacity to offer more, so don’t be afraid to ask them, provided the two steps above are already in place. A sense of mastery is experienced when a new and challenging task is equal to the person’s ability to complete that task. By providing new opportunities, you are providing your best employees with the chance to experience mastery and ‘flow’ at work. This is an intrinsic reward task that can’t be counted in dollars and cents, but it will certainly have an impact on your bottom line. Rewarding and keeping your best employees requires giving them purpose, a sense of belonging and a chance to shine. These are covered in the points above, but there is one more thing — and it’s probably the most important of all. Your best employees achieve that status because they know their job, know your business, know your industry and know your market. By asking for their input and really listening to them, you will not only learn a lot, you will also uncover the secret ingredient to engagement and retention. Acknowledgement and recognition are basic human needs. We can believe these needs are satisfied with a bonus, pay rise or award. To some extent, they are. However, recognising your best employee’s value by seeking and respecting their opinion can be a much more powerful reward. This entry was posted in Engagement, Motivaton, People Management on July 17, 2015 by Susan Rochester. This edition of What’s your story features John Boylan, the current HR Manager at Greenpeace Australia. Since his beginning as an Army Cadet to his current position, John has had a very interesting career. I’m currently working as Human Resources Manager for Greenpeace Australia Pacific. Broadly speaking, I’m tasked with all the HR functions of Greenpeace in our geographical region. I do a bit of fitness training for a local rugby team called Sydney Irish. It’s a largely expat group and leans far more to the social than to the competitive side of things. In saying that, they’ve won two trophies in their first two years so there must be some talent there! Aside from that, although over a year and a half in the country, I still see myself very much as a tourist in Australia and so spend my time trying to figure out what exactly is going on in Australian people’s heads…an endlessly fascinating pursuit. I had absolutely no expectations in school of what I was going to be become…not in a negative sense; I just had complete confidence that I’d choose my own path and not conform to what seemed the obvious choice. I still do that and I still have no idea where I’ll be in 5 years’ time…and it’s made all the difference! My first job was when I was 13 at an amusement park stall selling dreams…..well, selling the dream of being able to knock 6 cans over with a baseball and winning a teddy-bear. The lady who ran the stalls used to sit in a caravan watching us all on CCTV cameras so if you stopped yelling out “3 balls for a pound!” to customers she’d come down and give out to you. Naturally I came to dislike this woman and took great pride in blocking the camera, knocking the cans over with my hand and presenting select people with their prize. My first REAL job I suppose was when I was accepted into the Army Cadets after school which kick-started a 12 year career as an Army Officer. I wouldn’t so much call it a turning point as confirmation of what I’d suspected, but when I was serving as a Lieutenant in Kosovo in 2008 I felt stymied by my role there. While the Irish Army performs an unbelievably valuable function in the peacekeeping sphere, being involved in the military side of things meant you could help, but only so much. After that, I knew I needed to get involved in a far more direct way with helping people in trouble-hit zones. I haven’t got there yet, but that’s the goal. Che Guevara. Reading his works and about his life in my early 20s completely restored my faith that there are leaders out there who will choose the harder right over the easier wrong, and that will act with disciplined selflessness in order to inspire orders through leading by example. He was intelligent, pragmatic, completely uncompromising, and guided by a personal set of morals, values and ethics that I could personally empathise with. I’d like to put my skills from the army into practice by coordinating international aid elements on the ground in disaster-hit areas or war-torn regions. I’d tell him that, as he suspected, nothing you do will totally meet your expectations, so as soon as you feel things have run their course, get out…..and trust in your ability to find what you’re looking for. This entry was posted in Careers, Case studies, Motivaton on July 7, 2015 by Harriet Rochester. As a (sometimes) trainer, I’m surprisingly cynical about the value of training workshops in changing behaviour. I know I’m not alone in this, and I think I now understand why. If I have a headache, I can take some painkiller but unless I change what caused the headache, the pain relief will only be temporary. If you have poor time management skills, I can teach you a range of techniques. They might help you get more done, but if your real problem is not being assertive enough to say ‘no’ when someone wants you to do something, all I’ve taught you is a smoother route to burnout. Similarly, we could run a session on bullying, but if your managers lack the emotional intelligence to read their impact on others and know when they are being a bully, not much will change. Early in my consulting life, I conducted a series of half-day workshops on bullying and harassment for an organisation with around 300 staff. We knew bullying was endemic and it needed to be stopped. We also knew this toxic culture was coming from the top as is, sadly, often the case. As you may have guessed, although they were scheduled and rescheduled into the workshops, the executive were always too busy and didn’t make it to the training. In this case, we didn’t even get the change to share the basics with them, let alone contribute to a wider cultural change – which is what was really needed. On numerous occasions, we’ve been called in to deliver a program for a specific purpose. This is well and good: a need has been identified and it is being addressed. But often there’s something missing. That something is data. Without knowing how bad the problem is and the evidence that supports our assumption a problem exists, it will be very hard – if not impossible – to know how effective the training intervention has been. Quite often, organisations choose to save money upfront by not doing a good analysis of their needs. Unfortunately, this attitude guarantees they will have no way of knowing – apart from feelings – if they’ve just thrown more money away on a pointless training exercise. How do you avoid these traps? Know what you want to achieve. Make sure you have current data that will allow you to track progress over time, and clear goals of what outcomes you would like to see in the future. Sometimes a workshop is not the best way to achieve your desired outcome. For example, poor morale may be due to one person. Then your decision is to keep or let go, and if you decide to keep the person your next choice is about how to manage their behaviour. While feedback on the day is essential, usually people are basking in the glow of new information or a day out of the office. What matters more is long term change.You must work out how you will measure this change, it could be anything from fewer incidents to feedback after one month. By following the steps above, you will be on your way to more effective training in your business. If you have any further insights or tips, please share them below. This entry was posted in Engagement, Motivaton, People Management, Training on June 23, 2015 by Susan Rochester. Following the tragedy of Germanwings flight 4U9525, the US Federal Aviation Administration has said it is launching a study into how pilots’ mental health is monitored. It follows on from Lufthansa’s announcement of spot checks, much like dope testing in sport. The deliberate downing of the flight in March 2015 by co-pilot Andreas Lubitz led to 150 deaths and prompted calls for safeguards such as a requirement for two people to be present in the cockpit at all times and greater sophistication in the screening of pilots. However, this tragedy also highlighted the potential dangers of precarious employment contracts and the anxiety such contracts can cause. Murder-suicide is a rare and extreme act, but there was much speculation about Lubitz’s mental health and what may have led or exacerbated his situation. We know that he was “signed off” work on the day of the disaster but still chose to fly. Also, it would seem that he was under considerable pressure at work – Lubitz’s girlfriend was quoted by the BBC as saying: “He became upset about the conditions we worked under: too little money, fear of losing the contract, too much pressure”. Setting aside the speculation, this experience of work as described by Lubitz’s girlfriend chimes with the results of studies carried out by us on behalf of the European Cockpit Association and the European Transport Workers’ Federation. The studies show that precarious work (by that we mean low paid and uncertain work), leading to insecurity is becoming widespread across the European civil aviation industry. For instance, in response to a questionnaire survey completed by more than 2,700 pilot and cabin crew respondents in 2014, barely one half of respondents agreed that their work gave them security. Of the 2,700 respondents around 70% were in permanent full-time employment. In terms of pay, legacy airlines have used low-cost subsidiaries, such as Germanwings (Lufthansa), Iberia Express (Iberia) and Transavia (AirFrance/KLM), in order to reduce labour costs. Terms and conditions of employment can be as much as 40% lower for employees at the subsidiary compared with counterparts who work for the mainline carrier. An alternative strategy adopted by British Airways has been to develop BA Mixed Fleet – new staff within the mainline operation employed on inferior (low-cost) terms and conditions. The idea is to grow this fleet of staff to service short-haul and long-haul flights if and when possible. It’s not a case of directly cutting benefits for Worldwide and Euro fleet staff, but gradually reducing the average staff costs. In response to the 2014 survey, fewer than 10% of respondents employed as cabin crew on Mixed Fleet contracts agreed that the pay and benefits were adequate to support their current lifestyle, while none agreed that these were adequate to support future life plans. Shortly after the survey was completed, the Guardian reported that Mixed Fleet staff were reliant on working tax credit (state benefits) to supplement their income. In effect, the government was subsidising BA’s operations. As for uncertain work, precarious contracts are perhaps most widespread at what have become known as the “ultra-low cost carriers”. Pilots at Ryanair, for example – whose current business strategy is “not to unnecessarily piss people off” – are predominantly hired on “self-employment” contracts. In 2013, around 70% of pilots were hired via these contracts and agencies such as Brookfield Aviation International (which hires the vast majority of Ryanair pilots), with no obligation on the part of the agency to offer work. This arrangement is tantamount to a zero-hours contract – one crucial difference between the Brookfield contract and a zero-hours contract, however, is that the former imposes obligations on the pilot to provide three months’ notice of contract termination. 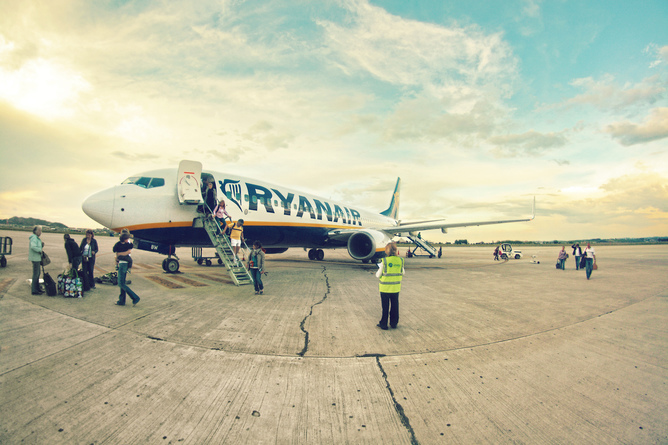 In 2013, a Ryanair pilot won a test case that found that the firm could not impose a €5,000 “penalty” fee for not serving a full three-month notice period. Ryanair is not the only airline to use “atypical” arrangements, a report from the University of Ghent in February 2015, based on a survey of 6,600 European pilots, found that Norwegian also hired many pilots in this way. Easyjet and Germanwings, however, used more traditional contracts. Current business strategy is to be nice. In the UK, the process of qualifying as a commercial pilot can take around three years and cost up to £100,000. Saddled with such a debt, a newly qualified pilot undoubtedly experiences considerable anxiety about finding and retaining a first officer job at an airline. The combination of precarious work (and the attendant insecurity) and the need to retain one’s job may influence decision-making processes and lead to poor judgement, for example reporting for work when unwell/unfit for duty. Aside from poor judgement, precarious work also has the potential to impact on safety in other ways. Alarmingly in our 2014 survey, only at two of the eight airlines included in the study did the majority of participants agree with the statement: “Employees feel comfortable reporting safety concerns to management”. One respondent commented of their colleagues that: “they are scared to report safety issues as our employment guide allows crew to be fired very quickly”. One consequence of the tragedy of flight 4U9525 has been the consideration of factors that may have contributed to the tragedy and possible means of preventing such an incident in the future – the deteriorating conditions of employment faced by flight and cabin crew should not be overlooked. Geraint Harvey is Senior Lecturer in Industrial Relations and HRM at University of Birmingham. Peter Turnbull is Professor of Human Resource Management Labour Relations at Cardiff University. This entry was posted in Careers, Motivaton on June 2, 2015 by Susan Rochester. Today’s career interview with Chris Page, National Manager – New Projects at Napier & Blakeley, clearly illustrates there is more than one way to get where you want to be! One thing that is clear from the discussions I’ve had at recent conferences about the future of work is that many of Australia’s issues with education and employment stem from our relatively recent focus on getting a university education. Aspiring to a degree is not a problem in itself, except that this goal may be at the expense of other forms of equally valuable forms of education for school leavers – both in terms of individual skills and the economy as a whole. As head of the new projects department in the National Tax Business Unit I am responsible for the growth of the National Property Tax Business throughout Australia. I’m also concentrating on growing the Napier & Blakeley brand internationally, and increasing recognition throughout the Property Development, Construction and Investment Industry sectors as the leading provider in Transaction, Asset & Development Advisory, Quantity Surveying, Sustainable Property Solutions and Property Depreciation and Insurance Assessment Advice. Putting what I do into a simple sentence is hard simply because my role here at Napier & Blakeley is really quite diverse. I do a lot of Business Development in varying sectors in the Property Industry, continuously growing the Napier & Blakeley brand. I’m also responsible for the growth of a new Tax Business Unit within the company which we’ve been working on for nearly a year – it is being launched and goes to market this coming July. All very exciting – and of course keeps me busy. Outside of work – well not as much as I’d like – I’m rather time poor. I try to keep it simple. I have a strict gym routine, attending the gym religiously regardless where I am travelling, or staying, at a minimum of 6 days a week. This for me is probably the most important part of my day. Not only because there is no better stress relief other than sweating it out on the gym floor but also because entertaining clients often means eating and drinking far too much – all of which would go straight to my waist if it weren’t for gym! I am an avid rock climber – yet another form of keeping fit, but also mind clearing. Climbing a wall requires constant problem solving – keeps my brain active in an unusual and physically active way. Let’s not forget my passion for wine and food – this is something I spend a great deal of time enjoying. Inside work – LOTS. Too much even. I tend to take on more than I should. It’s the price of absolute career commitment. Absolutely not. Nowhere near it. I finished school quite young – and at the time I had no idea what I wanted to do – apart from the typical high school dreams. Great job, lots of travel, lots of money, all the glory. Unfortunately something we don’t quite understand as teenagers is the iceberg theory. When it comes to successful careers generally people outside only ever see the top of the iceberg – the success and glory. And as we know with icebergs, the bigger portion is under the ocean hidden from view. Stress, responsibility, sacrifice, risk, persistence regardless of challenges or failures on the way. Endless hard work. But it’s all worth it, for that small bit of super white bright ice soaking in the sunshine at the top. I think I learnt rather quickly – by being thrown in the deep end in the early years of my career that there is more hard work than there is reward. I had more work than I did have hours in the day. But I fought through it – always taking on more than I could handle. Biting off more than I could ever chew – but I chewed through it all. Perhaps at great personal and social expense. But if you want it bad enough – you will do whatever it costs to get it done. Success is by no means easy – it wouldn’t be rewarding if it were. When I finished school I thought eventually I’d end up in Construction Management or something related to it. And I have done that, from Contracts Administration on hundred million dollar construction sites, to being project manager and development manager on sites just as big. Then on to acquisition and development management in the global property market – something I never even dreamt of doing, let alone before the age of 30. And now I’ve jumped fence to the consultancy side – working with a great deal of developers, asset and fund managers across the country as well as Southern Asia. A lot of my work these days is within the Property Tax sector. Tax is definitely something I never ever considered being remotely involved in – however property tax is one of the good taxes – it’s the one of the few taxes that gives back!! It’s nice to work in a business unit that helps property investors make more money!!! When you remove common boundaries or as I call them, our comfort zones, and you let your career take the wild paths without fear of the ‘what if’ then this is when your career will take you to places and heights you never expected. I was 13 – far too young to have a legal job, but I was tall and looked older than 13 so managed to sneak my way into my first ever job. Living on the Gold Coast – when I wasn’t at school or at home I was mostly likely found on one of the two ice rinks ice skating and playing ice hockey. Naturally I started working at one of the rinks. It was, at the time my ideal dream job – being paid whilst getting to skate. Loved it. I worked at ice rinks on the Gold Coast and then down in Melbourne (after a family move at 15) up until the last possible moment when university and my apprenticeship took all my time. This is a hard question. There are a couple of turning points. Spending a few weeks in Canberra at the GTA (Group Training Australia) ‘Today’s Skills, Tomorrow’s Leaders’ program was definitely an eye opening event. It lifted my ideas of what is possible to a whole new level. I think travel is also something that can help us grow, or act as a turning point. When I moved to London – my entire life was shaken upside down. New job, in a new country, new everything – it challenged me to a new way of thinking. Primarily because it exposed me to a whole new level of success. Success you don’t see too often in Australia. The abundance of successful multi-millionaires and billionaires that I was lucky enough to learn from in the UK really taught me that success is not something you get or are given (well for those lucky to be born into it perhaps this is the case). Success is something you sacrifice for, something you dedicate your whole life to earning. It’s the reward that we are lucky to earn after a life time of effort, hard work but most of all smart business decision making. But let’s not forget success is not only wealth – it’s family, and life in general. I think it was a turning point meeting people who had obtained great wealth and success at the sacrifice of much else. Family, friends – time. Learning that success is more than just wealth and power – this teaches us that we need to work hard towards a happy balance. And that will be something different for everyone. I admire a great many people. Kerry Packer is someone I grew up admiring, he was born into wealth, but he grew up in an era where you worked for it. He lived life to its fullest – made good and bad decisions, but regardless of outcome continuously fought to better himself and his businesses. Aurelio Peccei, an Italian scholar and industrialist of the 20th century is probably one of my all-time most admired individuals to read about and more importantly learn from. He is perhaps best known as the founder of ‘The Club of Rome’ but for me, he was a man who survived imprisonment, torture and very nearly execution during WWII, he is the one man who turned post war Fiat Corporation into the mighty international beast of a company that it became in the late 20th century. When Aurelio founded The Club of Rome, he introduced the world to the idea of an international think tank. A forum for scholars of all nations to come and think aloud – to present the world with ideas of how to better humanity for the greater good. Limitations? What limitations? By simply thinking ‘if there were no limitations’ you’re already placing them upon yourself. There are no limitations! As I’ve always said, people who tell you to pull your head out of the clouds simply say it because they themselves are too scared to see what’s above them. Limitations are something that generations before us were guided by. People were born poor and were to stay poor, or they were born into wealth and it was their ‘birth right’ to remain wealthy throughout life. Thank god for the industrial revolution. Today people can be born anywhere in the world, from any family, any race, any religion, any anything and become wealthy, successful and powerful. The only limitation we have are those which we lock ourselves into. If you truly want it – you will do whatever it takes to get it – or die trying. If you want it that bad that is. Rome wasn’t built in a day, and neither is a career. We’re placed under so much pressure these days that we forget to stop and smell the roses. So simply put, the only think I would advise myself on is time. Slow down, the one thing we learn with age is that the journey is where the fun happens. The destination is death so why limit our journey? Take risks, have fun, work hard and enjoy where life takes you without worrying about ‘what if’! This entry was posted in Careers, Case studies, Motivaton on May 13, 2015 by Susan Rochester. Predicting the future is always a risky business, but it is also a fascinating exercise! Here’s some data from McCrindle Research that gives us a taste of who you will be dealing with in your workplace soon, if not already. To read the original article, click here. What have you noticed about the generation entering the workforce now? We’d love to read your observations, so please share them below. This entry was posted in Careers, Engagement, Motivaton, People Management on May 11, 2015 by Susan Rochester.